Original Songs by Grif, Rock, Blues, Smoochie love songs. All instruments played by Grif. 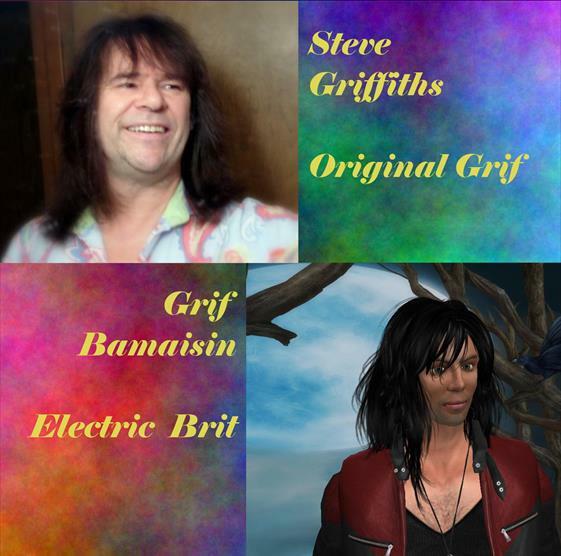 Grif is Steve Griffiths who performs as himself, and also performs as Grif Bamaisin is the virtual world of Second Life. The world is virtual, the music and the listeners are real. 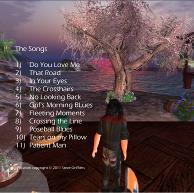 The album is a genre crossing collection of original music and songs inspired by the events around me. If you order the CD from my site directly, I will sign the cover, and include a Grif Bamaisin Electric Brit guitar pick. Shipping is free in the US and Canada, and at cost for other countries You can get digital downloads from iTunes, CD Baby and DigStation. Links on the left. the thing that keeps us true? Going on behind closed doors. Deaths not worth fighting for. I see my life, reflected in the skies. I can't say with certainty. For the whole world to enjoy. I've got those poseball blues. But I wanna get close to you. But I'm gonna get close to you.